With Valentine's Day approaching, our thoughts inevitably turn to romance. But what of the lonely, the lovelorn and the wearable tech advocates? Is there hope for any of them this 14 February? Google Glass as we know it may be dead, but if experts are correct we'll all have smartglasses hanging off our faces by 2020. That seems pretty hard to believe while Google Glass maintains its position as the weird old uncle of the tech family, the one no one really wants to be seen with - least of all in a potentially romantic situation. If FKA Twigs can't make these things cool, the rest of us have no hope. But if smartglasses are about to take off, then we need to know: can you wear Google Glass and still pull? I went to find out. And so I find myself representing the hopelessly single and about to chat up strange men in four-minute intervals while wearing Google's folly at a local speed dating event. The bar is one of those places on the outskirts of Central London that you might have a vague memory of going on a work night out once. It might have been okay when it first opened but now relies on you being too smashed and distracted by low purplish lighting to notice that it's in serious need of some TLC. Downstairs where the speed dating takes place, the women sit in huge clamshell booths finished in white leather while the men flit from plush stool to plush stool peddling their amorous wares. With 15 minutes to go before the dating kicks off, I decide now is the time to put the Glass on. Better to ease into it as people arrive than whip them out dead on 8pm. The barman looks at me funny - I catch him looking several times while I busy myself with my phone and my pen and my scorecard. The energetic host, Michael, is enthusiastic about Google Glass at least. He comes over to say hello and tries them on, yelping about how it makes him look like Geordi La Forge, a Star Trek reference that's lost on me until later. Then, with a short sharp blast of a whistle, we get into it like school kids rushing the field in PE. My first date is Matt, who is wearing a suit to speed dating and has therefore already ruled himself out of my affections. He's straight in with the Google Glass chat - turns out he's in computing and mainly wants to know how I got hold of them. We talk about his business for a while and he just about remembers to ask me what I do before the whistle blows and he's off to the next girl. I assess myself for signs of romantic feeling and am confident there are none. Number 2, Dean, takes an altogether different approach. He's careful not to mention the glasses. At all. In a way, this is weirder than the men who want to talk about nothing else. The ones who don't acknowledge the computer-glasses strapped to my face politely ask about what I do, but their eyes flicker up to the little screen above my right eye every other word. Better than their eyes flickering down to my chest, I tell myself - but somehow it's not better. All they're registering about me are the glasses; not my body, not my personality. Just the glasses. And no one's going to fall in love with the glasses. Number three, Tarek, asks if he can try them on - ok, sure, I tell him, and have to guide the nose stand onto his nose lest he spend the whole four minutes struggling to whackamole them on himself. I guess this could have been romantic but Tarek reminds me of my dad and went on to talk at length about his favourite brain-training game. At this point I'm so flustered that I end up recommending Candy Crush to him. “We're going to have to talk about these," a portly middle-aged man says firmly as he sits down uncomfortably close to me. “Ok," I say. “What do you want to know?" “Oh, they're Google Glass. They're like glasses that connect up to your phone." I'll admit it's not the greatest sales pitch of all time but I wasn't expecting number 11 to get so hostile in his response. He looks baffled verging on angry and growls, “Why would you want to do that?" “Um, well, you can take pictures and get maps up and stuff..."
“I see. Well, I'm in property development..."
It wasn't exactly the start of a beautiful friendship for number 11 and I as we went on to fall out over his ethically questionable approach to landlording. But that's for another thinkpiece. “At least you have a talking point," number five, Nick, tells me, as though trying to console me. “You're the girl with the Google Glass." 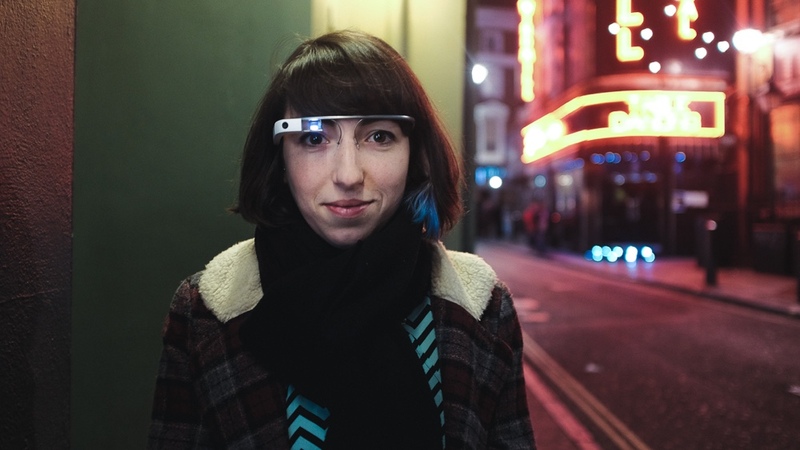 To others, I wasn't so much the Girl With The Google Glass as just The Google Glass. “Well hello Google Glass," was one opener, while a man who lived in Clapham went with, “Look at this guy!" Cheers mate. Number 13, a scientific researcher named Martin, didn't bother with hello before launching into “What are they?!" then describing them as “intimidating". Things went better with number eight. Wearing a hoodie and blazer combo, I guessed he was either a programmer or teacher's assistant. Turned out Danny was a film director and his first questions was to ask if I was seriously there to date or just doing a “blog post". Urgh. I told him I was serious and that the Glass thing was a dare. The rest of the comments seemed to boil down to one basic theme. “Are you controlling my mind with those?" asked one, while Harry asked if I was a “tech freak" which I guess could have turned into something suggestive if he'd been hot or we'd been capable of understanding anything each other was saying. “Are you a robot?" was the question from a decorator named Dan, before very firmly ticking 'No' on his scorecard while I could see. It was harsh, but a fair assessment of our interaction. So over 17 gruelling four-minute dates, how did wearable tech fare? Well, the reactions basically fell into two camps: straight-up denial of the Glass's existence, like I'd turned up wearing a dead fox around my neck or sucking a dummy. However, what I found most was a strange form of defeminisation. I wasn't a girl, I was a robot, a tech freak, a person to ask for phone advice. I don't really like talking about technology with men - it feels like they're waiting to catch me out with a triumphant “Aha! You don't really know what you're talking about after all!" - and I found myself longing for “where are you from" and the inevitable “but you don't have the accent!" that always follows. We have our little dance, strangers and I, and Google Glass rudely cut in. But as uncomfortable as it was to be The Girl With The Google Glass for an evening, it didn't necessarily stop me from finding a potential new beau. On the speed dating scorecard you get three boxes to tick for each person you meet: Yes, No and Friend. The next day you log in to the website to see if you made any matches. I ticked No for all of my 17 dates but one. And he ticked yes too. Even though I told him it was a dare. Thanks to DateInADash for letting me speed date with them, Lucy Hattersley for lending me her Glass and Dan Wong for the photos.